I’ve been scheming up this project for over 6 months. Now that it’s winter break, I finally got around to working on it – and it was one of those projects that I’m kicking myself for not starting earlier. The true purpose of this fireplace cover is functional, not decorative. 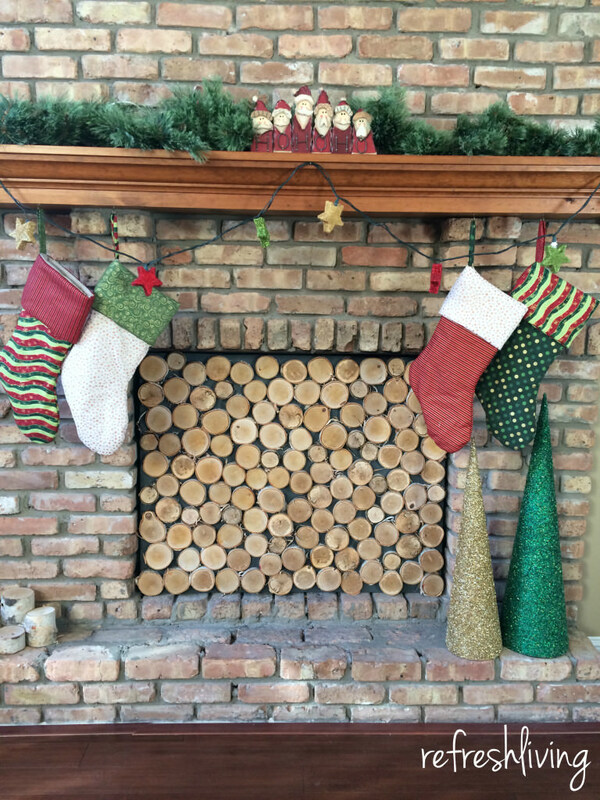 Our wood-burning fireplace is an energy hog, drafting in cold air in the winter and hot air in the summer. During the winter, the floor in front of the fireplace is cold, and that half of the room is always quiet chilly. 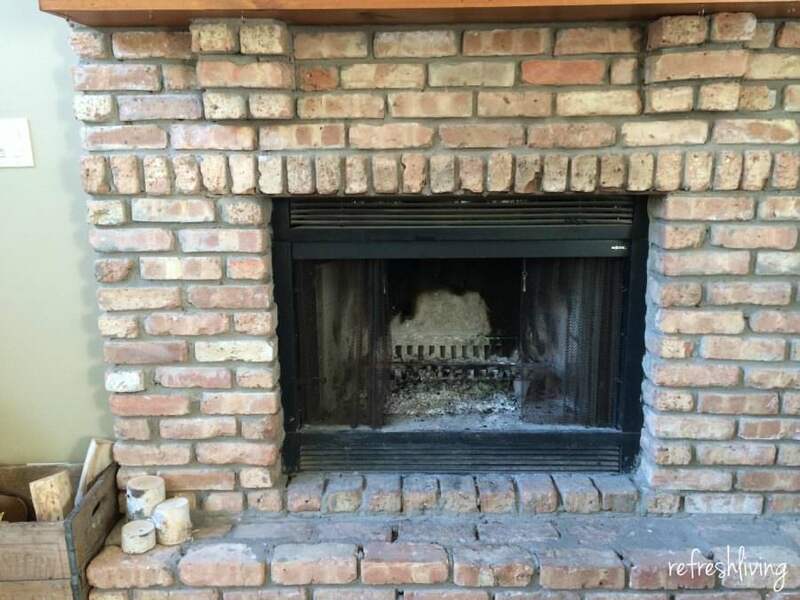 I looked into fireplace covers and insulation screens, and honestly, they were all pretty ugly. I set out to create my own. I cut a piece of 1/4″ plywood down (using my new table saw – insert *girly, giddy screech*) to fit in the opening. Then, I cut down one inch thick styrofoam. (I bought it from Menards for $1.50, but knew I could have just saved up some foam from inside packaging and it would have done the trick as well. However, I refuse to save that stuff, because I hate all the little static-y balls it gets all over the house.) 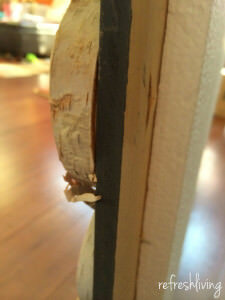 I used foam adhesive to glue it to the back of the plywood. The front of the plywood got a coat of dark grey paint, and then came the fun part – making it pretty! 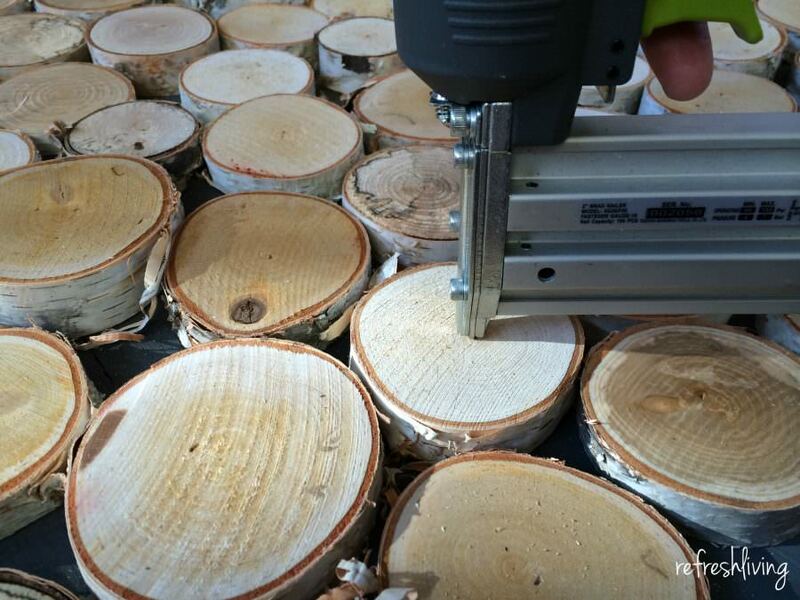 I actually had trouble finding full circle birch logs. I finally found a nursery by my school that carried birch yule logs, which ended up working perfectly. I cut them down into varying widths (between 1/2 inch and 1 1/2 inches). 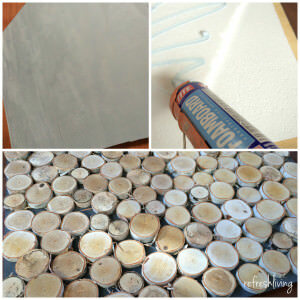 I’ve devoted a whole post to how to buy birch logs for cheap – you can check it out here. I had originally planned to use liquid nails to glue the logs onto the plywood, but patience is not one of my strongest qualities, and after three hours of cooking the discs in my oven and still seeing some moisture rings, I couldn’t wait any longer. My second option was to use my nail gun to nail them down, which I was worried would be visible. I tested one log out, and you could barely tell it was nailed in. I went with option 2, and started nailing the logs down right away. I used a couple of different lengths of nail to ensure each log was attached well, without nails hanging out of the back of the foam. 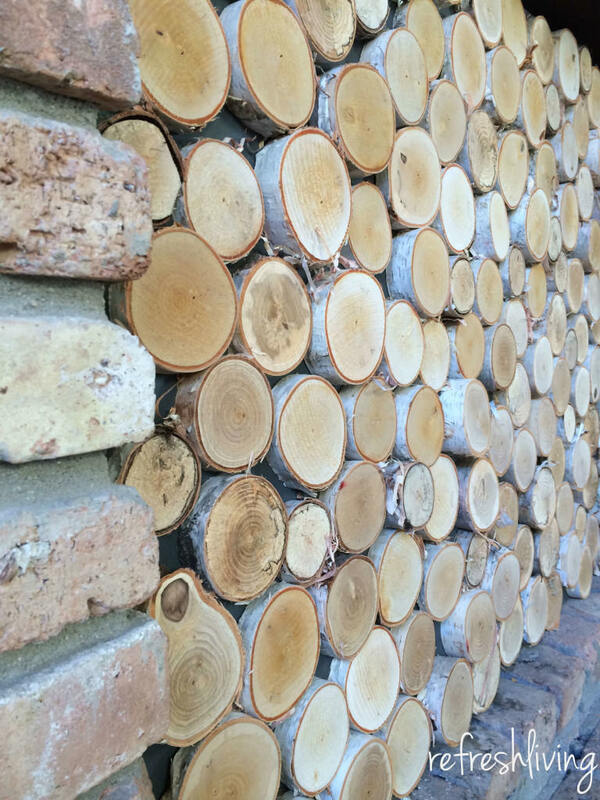 The nail holes were so faint, that I actually couldn’t even tell which logs I had nailed down just by looking. I had to tip it over a couple of times to see which logs fell out and still needed to be nailed. Right now, it’s sitting in the fireplace opening, but I plan to put a latch on either side of the fireplace to hold it in place. Of course, it needs to be easily removable so we can still use it for fires! You did a wonderful job on your fireplace, I am blessed with a heat blower, so mine is already covered for winter and Summer. GOD bless. and thank you for sharing. yes, yes, a million times, yes. enjoy! I LOVE that!! Our last house had a black felt covered board to keep the fireplace from drafting, but your cover is just beautiful!! Thanks for sharing at On Display Thursday, join us again this week! I’m sorry but this is simply awesome…I love everything about it! Great job! 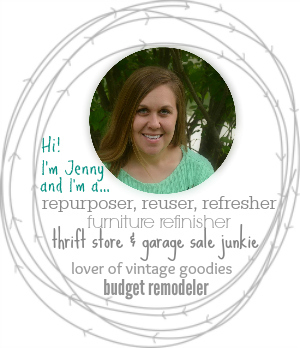 Thanks for sharing it at On Display Thursday- I am featuring you project this week! Don’t forget to stop by and check out this week’s party! Oh, thanks so much for featuring it!! I’ll be sure to be stopping over! 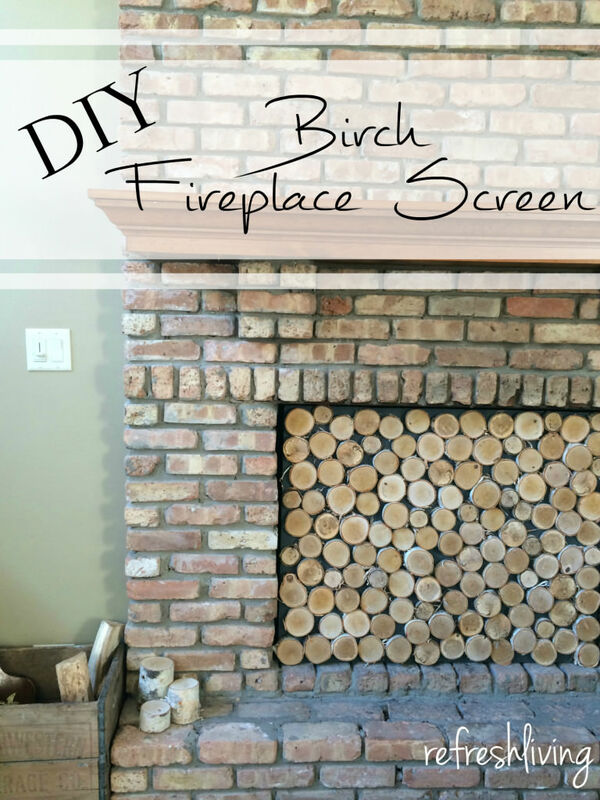 I love your birch tree fireplace, about how many logs did you use. I need to do this! Thanks, Karen. 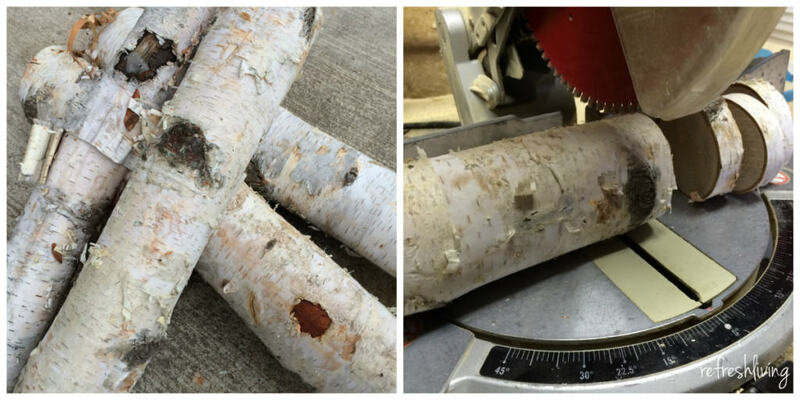 I think I used 5 logs – the opening I needed to cover was 32″ by 24″. Best of luck on your project! 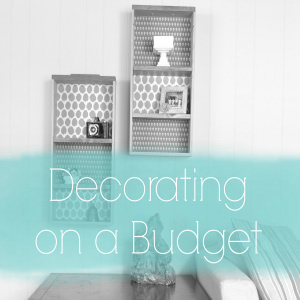 This exact project has been on my to do list for a couple of years! Love how yours turned out! I’ll be saving your post for future use! 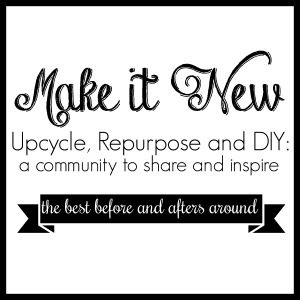 😉 Thanks for linking up with us at Best of the Nest. Looks awesome!!! I can’t see the nails either 🙂 and congrats on the table saw! I’m just about to learn to use one myself and I am S.O.O.O. excited. Thanks! Good luck with your table saw adventures! What an awesome idea! 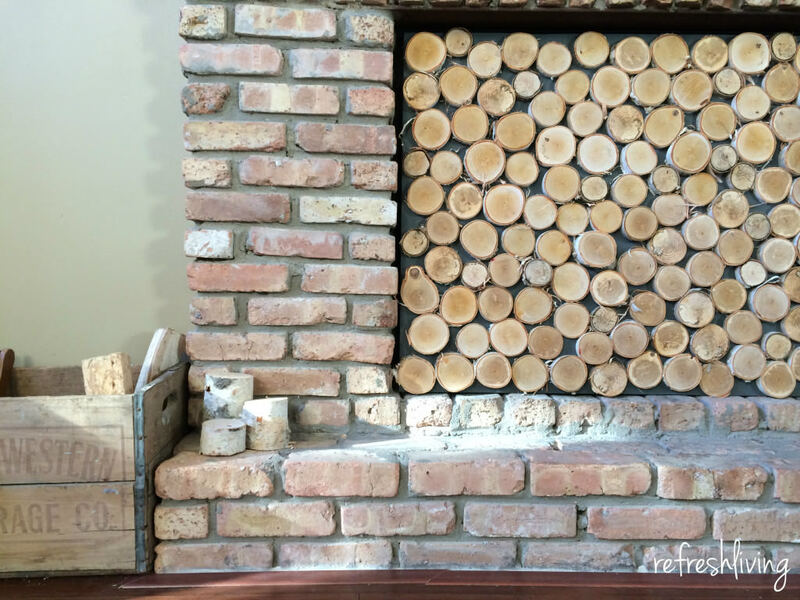 My fireplace isn’t drafty but I want to do this anyway just because it looks so fantastic! And congrats on the new table saw – I’m sure there’s lots of great projects coming our way because of it! Thanks so much! I’m quite excited about my new “toy”!